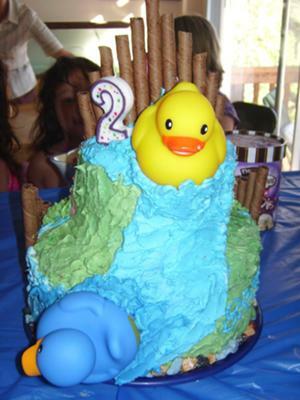 My kids decided that for their birthday the baby should have a ducky cake and my six year old should have a Little Mermaid cake, at least they’re both water themes! I wanted the cake to be big enough to serve 30, and to be individual for both of them. A flat cake just would not do. This is the ducky side of the cake, notice the rubber duckies floating down the river, I attached them with skewers. Super Moist cake, super delicious butter cream icing, rock candy,rubber duckies and blue sprinkles decorate the cake. The tube cookies provide the separator wall. The bottom layer was 4 layers of marble cake held together with vanilla custard the top 2 layers were strawberry cake held together with vanilla custard. The whole cake was completed with butter cream icing.